Beidahu Sky Mountain | Beidahu Sky Mountain | Ecosign Mountain Resort Planners Ltd. Client The Physical Culture & Sports Commission Jilin Province. Melco Resorts Ltd. In 1999, Ecosign prepared a ski area Master Plan of the Beidahu ski facility which primarily focused on the 2007 Asian Winter Games, for the Physical Culture and Sports Commission of Jilin Province. This plan was geared toward determining the most economical way of holding the Asian Winter Games, as the Provincial Government was not looking beyond 2007. As such, the development of a four-season destination resort was not the focus of this plan. 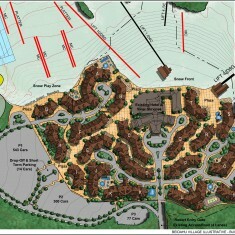 However, several of the preliminary concepts that were presented in 2000, illustrated the potential of the site for destination development which included a resort village with overnight accommodation and high speed, detachable chairlifts, as well as base lands suitable for two championship 18-hole golf courses. 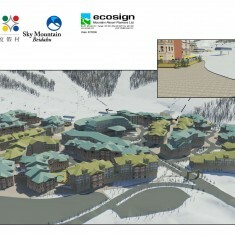 Ecosign’s conclusion was that the Sky Mountain site is one of the best in China, with a mountain capable of holding an Olympic downhill event and plenty of flat base lands suitable for the development of a four-season destination resort village with golf and other recreational activities. 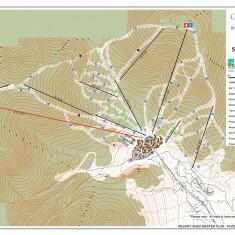 In 2006, Ecosign explored several different mountain and village concepts for Intrawest. In 2008, Melco China Resorts took over the operation of the Beidahu Resort and Ecosign was commissioned to prepare an update of the Master Plan for the creation of a four-season destination resort which included both a revised mountain plan and a resort village. The pedestrian oriented village included ground floor commercial space with public overnight accommodation units above and central plazas and meeting place. The plan also included other recreational activities such as a snow play area with snow tubing and beginner skiing, tennis, mountain biking and pedestrian trails, sightseeing gondola with a mountain top restaurant, golf and cross country skiing. 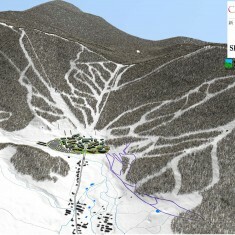 The site has seen significant development both on the mountain and in the base as a result of the 2007 Asian Winter Games. The resort was acquired by the Qiaoshan Group of Beijing and the next phase of mountain and hotel development has begun. Beidahu is probably one of China’s largest and most successful mountain resorts and skier visits from the 2010/11 season totaled 67,000.